Here at Pure Periodontics we are supporting the Oral Health Foundation and their Mouth Cancer Action Month. In 2016 alone, more than 7,000 people in the UK were diagnosed with oral cancer. This campaign aims to raise awareness of mouth cancer, educate, and make a difference by saving thousands of lives through earlier detection and prevention. Ideally, we want to encourage people to amend their lifestyle choices to reduce their chances of ever being diagnosed with oral cancer. However, this is a condition that can affect anybody, and early detection and diagnosis are vital to improving survival rates. 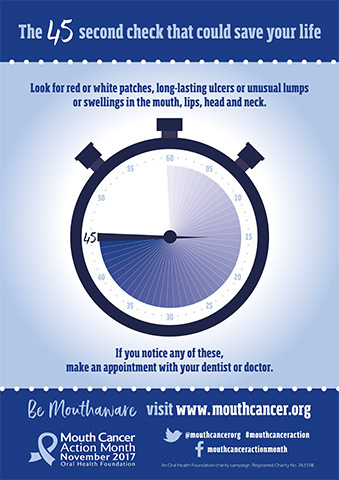 Be sure to attend your regular recall appointments as advised by your dental professional, who will carry out screening for oral cancer at every visit, and follow the advice given below between appointments. Remember, if in doubt, get it checked out! Know where to look: Oral cancer can be found in many areas, such as the tongue, lips, cheeks, roof of mouth, floor of mouth, throat, head, and neck. Know what to look for: Ulcers, sores, changes in colour, red or white patches, changes in texture, tenderness, lumps, bumps, swellings, or difficulty swallowing.